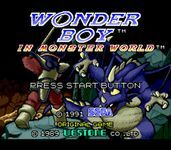 Wonder Boy in Monster World (Wonder Boy V Monster World III in Japan) is a title in the series of Wonder Boy games which were developed in the 1980s and 1990s by Sega and Westone. It is the fifth game in the Wonder Boy series, and the third game in the Monster World sub-series. It is also the last Wonder Boy game to be officially released in English. Wonder Boy In Monster World puts you in control of Shion in his quest to save Monster World from the evil BioMeka. It controls like your standard platform game: run, jump, and kill enemies. The game is filled with RPG elements such as talking to townsfolk, collecting money to buy items, extending your life bar, and equipping a large variety of armor, weapons and magic. This game is as the Japanese titile suggests, the fifth installation in the Wonder Boy series, and the third in the Monster World series. Source: Wikipedia, Wonder Boy in Monster World , available under the CC-BY-SA License.